The calendars have turned to February and pitchers and catchers report soon. 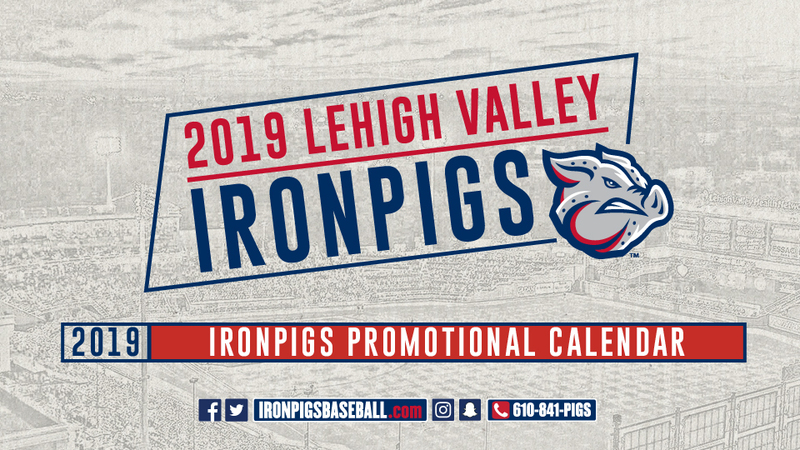 With baseball on the horizon, the Lehigh Valley IronPigs are thrilled to release their promotions calendar for the 2019 season. Earlier this week, the team released its bobblehead giveaways, fireworks dates and many of its theme nights, and today the full calendar was unveiled. Returning weekly promotions include postgame Kids Run the Bases presented by Lehigh Valley Reilly Children's Hospital each Sunday, TD Bank Dog Days featuring $1 Berks hot dogs on Mondays (guests are also welcome to bring their dogs to our April 7, May 7 and June 12 contests) and extended pregame happy hours each Thursday starting at 5 p.m. The team will host Friday Night Fireworks after each Friday home contest and Saturday fireworks starting in May. This season, Coca-Cola Park will also see Patriotic 3-D Fireworks on Thursday, July 4 and a special Sunday Night Fireworks display on May 26, the day before Memorial Day. Individual tickets for every 2019 IronPigs home game will be available Saturday, March 2 at the team's annual Pig Day celebration.